Cvetlične ogrliceThere are 73 products. Eco resin real hepatica (liverleaf) necklace for men. The flowers were handpicked, the necklace is made from skin friendly materials. 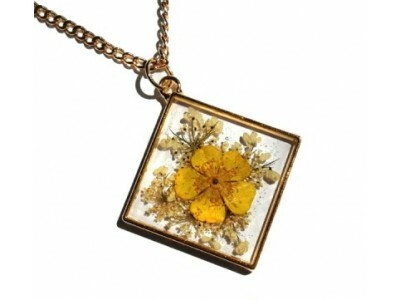 Eco resin real flower forget-me-not necklace for men. The flowers were handpicked, the necklace is made from skin friendly materials. An angel - fairy necklace / pendant made from real flowers and eco and health friendly resin. The angel in this piece of angel jewelry is made of my own orchid (the body of an angel), a daisy (the head of an angel) and Angelica archangelica flower (the background of the necklace).